Earlier this year two groups of academics (scientists and faculty members) at the University of Toronto wrote letters of concern to the President of the University regarding the course Alternative Health: Practice and Theory HLTD04H3-S, Special Topics in Health taught by Beth Landau-Halpern, a homeopath. 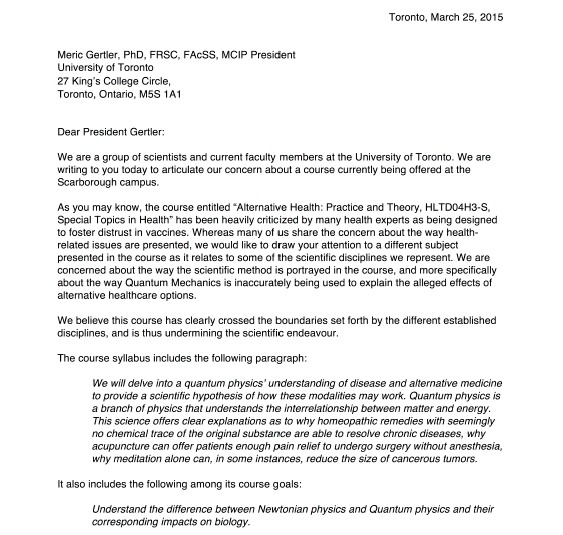 One group wrote about their concerns that the course presented false information on vaccines thus fostering distrust and the other wrote of their concern regarding the inaccurate use of Quantum Mechanics to support mechanisms of action of alternative medicine (see below for screenshots of the letter regarding Quantum Mechanics). Regarding vaccination, Week 9 of the curriculum is “Vaccination – The King of Controversy.” No medical, nursing, or basic biology/immunology textbooks or articles are referenced in the required reading nor is any information from Health Canada or the World Health Organization. Instead, the required reading/viewing and additional information for the students (meaning what they will learn and thus take away from the course) includes Andrew Wakefield (who lost his medical license for falsifying data in a now beyond infamous study with falsified data) and anti-vaccine propaganda sites. The below images are screen shots from the course in question at the time in question. We will delve into a quantum physics’ understanding of disease and alternative medicine to provide a scientific hypothesis of how these modalities may work. Quantum physics is a branch of physics that understands the interrelationship between matter and energy. This science offers clear explanations as to why homeopathic remedies with seemingly no chemical trace of the original substance are able to resolve chronic diseases, why acupuncture can offer patients enough pain relief to undergo surgery without anesthesia, why meditation alone can, in some instances, reduce the size of cancerous tumors. To say I was dumbfounded would not be an understatement. If ignoring the concerns of scientists about the abuse of Quantum Mechanics wasn’t bad enough, to conclude that the teachings about vaccines as represented by the curriculum are not “unbalanced” from a “scholarly” perspective simply renders one speechless. As far as immunization is concerned the curriculum is a veritible lesson in false balance and perversion of the scientific method. In my opinion the response basically boils down to, “Oh give her a break, she’s new and it all sounds a bit new age and that’s really what people want, but we’ll have her make it a little more sciencey next time” when it should have been a “thank you for bringing this to our attention, we share your concerns and they will be addressed immediately. This instructor is now on probation and all course material related to medicine and science will need to be approved by a faculty member in the appropriate field (minimum of masters level or medical doctor).” Remember, this isn’t misquoting a study, a new field where there is little published work, or a published academic having an unpopular but scientifically plausible opinion in a field. The material presented about Quantum Mechanics and immunizations is wrong and the equivalent of being in an alternative geology course teaching that the world is flat with references from 1300. The only thing worse than this course being taught at a Canadian University is the President, Vice-President and Provost ignoring/inadequately responding to legitimate concerns about science and education. If the University of Toronto is an institute of higher learning that aims to teach facts then this course should be scrubbed. 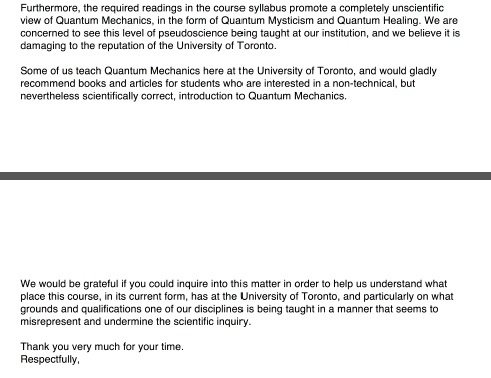 Whether this is a case of nepotism (the course instructor is the wife of the Dean of the Scarborough campus) or the beginning of the end of the scientific method at the University of Toronto remains to be seen. Confusing robust academic discussion and academic freedom with false balance and scientifically unsupported information is wrong and dangerous. In my opinion a public inquiry is needed. Quantum mechanics to “explain” homoeopathy? Cats in two places, both alive and dead simultaneously and vaccines? I can’t think of any time when Newtonian physics was used to explain anything in medicine. What a totally weird idea. refute attack correct argue a preventivemed? website which is rabidly anti vaccine. I even call them murderers when they get ignorant parents to deny vaccines to their children. And other commenters how sure are you that all UoT profs only proffer driven truth not propaganda? Of course it is patently ridiculous to ask an anthropologist to judge a medical issue. Why not get an MD to explain quantum mechanics? Or a mathematician stoicism? Or a physicist taxonomy of archaea and chromista? Yet who doesn’t know that chemistry is an offshoot of alchemy and astronomy of astrology? Can pseudosciences and superstitions and magic be studied scientifically? that half of Darwin stet. but it is unclear yet extremophiles archaea chromista etc. Cosmology? Maybe there wasn’t a big bang after all. Only ignoramuses and imbeciles think we have all the answers or that science has the final answers. It doesn’t even know the correct questions. Most of what I learned in medschool forty years ago was bunk nonsense and silliness. Only the basic science stands intrepid but still very incomplete. We don’t even know such basic questions if a strict vegetarian or carnivorous diet is best. We only claim to know that junk food is bad for us. quackery. Now it is almost received wisdom. Remember mucosal barrier? Now we treat PUD as an infection. Persecution is unsavoury even for the correct reasons. Have we not learned anything? would do a lot for their mental development. And they might even get a notion of the scientific method which actually proceeds by negation. Try Descartes. If we apply this type of logic to medicine, why not apply it to engineering too? The obvious reason why we don’t apply the “right to be wrong” logic to engineering is that doing so would get people killed when the inevitable failures occurred. And it’s different here because…? Not when their supposed right to be wrong places third parties at risk, no. As is frequently said, your right to swing your fist ends where someone else’s nose begins. Oh rats. That is embarrassing! The only teaching of Wakefield should be in a course about scientific fraud and it’s dire consequences. And how to practice medicine without being officially licensed anywhere in the world. Great blog! It saddens me that any university would find instruction from a homeopath acceptable. And lots of spelling errors throughout, especially in the last paragraph. That’s what happens when you put up a post done on an iphone and the spell check doesn’t work on the mobile platform. Indeed: much as I disagree with homoeopathy, I would still think that their place in a Uni is to debate how it works, but not to teach as received scientific wisdom that it does so through quantum mechanics, molecular ‘memory’ or whatever the next barmy concept might be. I’d support their freedom of expression, but only as part of a debate where their ideas can be totally refuted. If there were any evidence that homeopathy does work, perhaps. Instead, however, not only is there no evidence whatoever that homeopathy performs better than placebo controls for asa treatment for any illness or injury, but also, in order for the fundamental principles of homeopathy (Theory of Miasma, Law of Similars, Law of Infinitessimals, etc.) to be valid, literally everything we now understand regarding chemistry, biology and physics would have to be not only wrong but be specatacularly wrong. 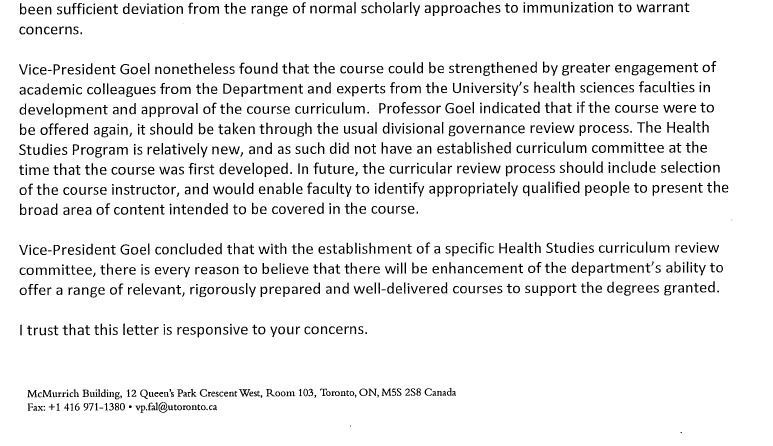 As I recall, the prof at Queens who presented much of the same vaccine material was yanked in days, before even an official response.It was later announced that she would not be teaching the course next year. This is a sad response from U of T.
Unfortunately, stupid people love to be dazzled by stuff they don’t understand and have a habit of linking unrelated things. That said, quantum mechanics and homeopathy? And, a sterling reading list… It seems like UToronto could use a purge of the administration along with some snake oil merchants. Small point. In the first sentence you parenthetically mention (scientists and faulty members). I’m sure you meant faculty members. No. You just misspelled faculty. I did go back and check first, though you would think it’d be obvious they mean faculty even if they’d made the same mistake. It’s not just Wakefield. Video #2 is a 7-minute anti-vaccine propaganda film from “Educate4theInjured” — expanding the false theory that “vaccine shedding” causes disease. Video #3 is 15 minutes of Sherri Tenpenny expounding on how vaccines are unsafe. Assignment #4 is 30 pages from Suzanne Humphries and Roman Bystrianyk’s poorly researched and poorly written diatribe against vaccines. If I were a UofT alumnus, I would be outraged. It’s remarkable that any credentialed university would permit a course that misinforms students so much. Why not teach intelligent design, phrenology and astrology, while they are at it. Creationists are full of pseudoscience to explain how God created the world in 6 days, around 6,000 years ago, how the biblical flood can explain the Grand Canyon and whatnot. My favorite his how some of them argue the universe expanded faster than the speed of light, and then slowed down to address the problem of a 14 billion year old observable universe based on red shift calculations. It all sounds scientific, but it’s not accepted science. I am very grateful that you brought this to light. This is an absolute outrage. It isn’t even “teach the controversy”, it is teach false and dangerous information. The President and Vice President should be seriously interrogated about the standards they accept at U Toronto. As a Dept Chair, if one of my faculty were teaching complete nonsense to the students I’d shut them down immediately, and if they screamed ‘academic freedom’ I’d grab that class by the horns, teach the science to the class and make sure that the prof never was in front of a class again. Misinforming students is not a protected freedom. Maybe courts would disagree with me, but if we are not standing up for the truth, what do we have? The University of Toronto needs a new department: a Department of Zetetic Astronomy perhaps, where Geomancy, Homeopathy, and general witchcraft can be brought together to form a new body of Received Knowledge. I think you mean it would be an understatement, or would not be an exaggeration. Yes, this is a disgrace for a large university, let alone a “mickey-mouse” college. This deserves an in-depth investigation by the CBC, Globe & Mail, etc. It would be nice to know what major sponsors in the science area support the UofT and get them to threaten to pull out. Or have quality high school principals come out and say that they will not be recommending UofT to their students. That might get the Pres/VP/Deans attention. Thanks for stopping by! Yes, please promote! When everyone has good info we are all healthier for it!